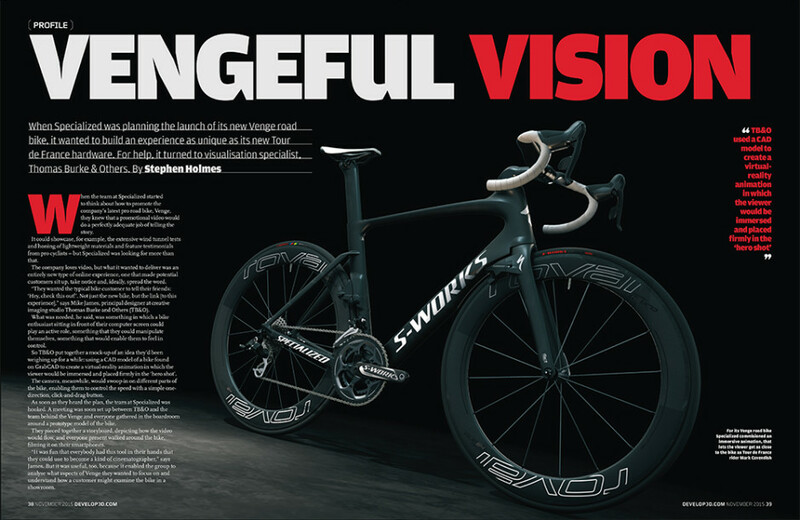 When the Specialized Bicycle Components marketing team was planning the launch of their new Venge road bike they wanted to create a unique and engaging experience for people visiting their web site. Specialized chose Thomas Burke & Others (aka TB&O) to create an immersive virtual reality experience that matched what they envisioned but hadn’t been done within the technical and bandwidth constraints of the web. Using KeyShot and a team of 3D professionals, they delivered the experience on time and within budget. A bike as technologically advanced as this one, with as remarkable an industrial design, deserved something more than just traditional video or still imagery. They wanted beautiful visuals that would show the intricacy of the design. Images and videos would tell the story of designing the bike in their wind tunnel and testimonials from pro cyclists who would race the bike and win stages in the then upcoming Tour de France, but the marketing team was searching for a unique web experience that used animation to expand the story while allowing the user to control how they viewed the bike. What they wanted was beyond what most animation experiences typically offered and unlike anything else on the web. With the pressure of a tight launch schedule, one big challenge for TB&O was to use CG software that allowed them to work alongside the Specialized engineers and marketing team to facilitate fast and efﬁcient collaboration. TB&O chose Luxion’s KeyShot 3D rendering and animation software because it has the functionality to get the job done while being easy-to-use for team members collaborating in real time. Whether side-by-side or over video conferences, KeyShot made it possible to make adjustments to “what-if” questions and see immediate results. Another challenge for the TB&O CGI artists was how to provide both the speciﬁc animations the Specialized team wanted and an interactive 3D-enabled desktop and mobile viewing experience. KeyShot offers both an animation tool and KeyShotVR which creates video quality ray-traced 3D content. The TB&O team used both these tools in combination to create “exploding” content and the immersive interactive experience. This had seldom been done before and never on this scale. This project pushed boundaries and wouldn’t have been possible without the support of the KeyShot development and support team. At the inception of the project, nobody anticipated that there would be more than 780 parts that all had to move in unison or within sub-groups of other parts. The animation of the front end of the bike was tricky because the parts were all on different axes. These parts had to behave as though they were moving with the steer tube that connects the handle bars and stem to the fork. Principal CGI artists Tim Feher, Mike James, and Dries Vervoort took real-time feeds of bike parts from the Specialized engineers and set about creating material surfaces that would make the bike appear real. The Specialized team wanted the result to be photo-realistic and not the typical neutral look of CAD renders. That meant that the CGI team had to spend time studying the look and feel of the actual ﬁnishes on the bike and its components. It also required setting up various lighting scenarios to see how the ﬁnishes behaved in the real world. KeyShot’s material editor made it possible to get the photo-realism that the client was looking for. Every material in this experience was created from scratch. One of the most challenging materials to tackle was getting the right look for the unidirectional carbon ﬁber that is naturally irregular and then sprayed black at joints and clear-coated to a matte ﬁnish. Additionally, to create a realistic front and rear wheel, the carbon rims had to be separated into multiple parts. The tires which are an important part in making this the fastest bike on the planet, had to be rendered from scratch. 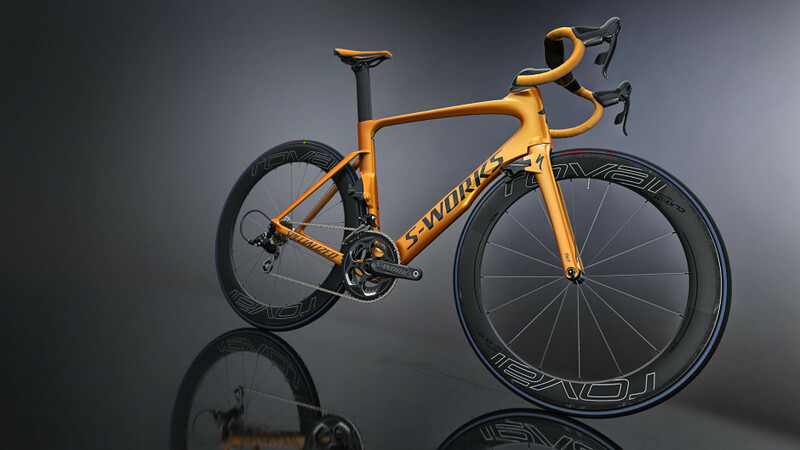 While KeyShot handles creating complex materials well, the team used Solidworks and Maya to create the components that didn’t exist in the CAD ﬁles supplied by Specialized. One of the most visually interesting parts of the bike is the proprietary integrated braking system. 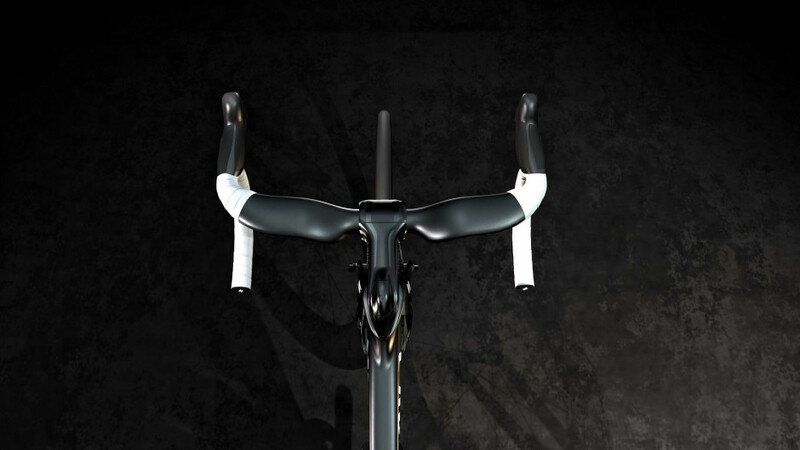 The front brake completes the forks trailing edge, aiding aerodynamics, while the rear brake drafts off of the seat tube and water bottle. 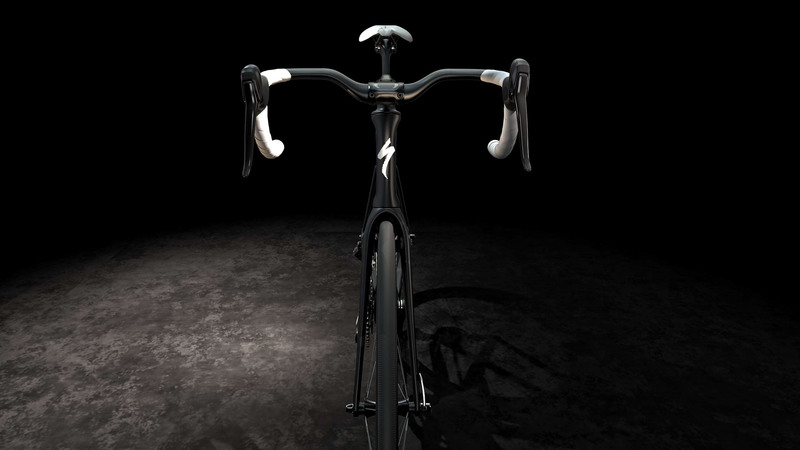 To highlight the front brake, TB&O built an animation that simulated the front wheel turning. This necessitated that the materials be believable and the lighting draw attention to the beauty and functionality of this unique industrial design. Typically, animations appear neutral or ﬂat because the lighting is a compromise. The problem being that if the light looks great at one camera position, as the animation moves there are inevitable points where the lighting is unacceptable. The compromise is fairly ﬂat light throughout. To create the emotional reaction the client was looking for, the TB&O team had to create a physical environment that was as simple as it was dramatic. So, rather than relying upon just a HDRI lighting environment, the team built a transparent set and supplemented the light provided by a custom HDRI light environment with 23 lights created from individual pieces of geometry. The result is dramatic light that highlights the product no matter where you are in the VR experience. Use finger or mouse to rotate the Specilized Venge. A valuable by-product of this work product is being able to repurpose the asset. Once the initial project was completed, TB&O created ten short videos that Specialized incorporated into their PowerPoint presentation to dealers. Similarly, it is easy to change the product ﬁnishes, the background, the lighting and to create still images as well as other VR experiences. While the project was initiated to support the web experience at launch, Specialized has found numerous other ways to use the assets to support social media initiatives, and other marketing and product development needs. More about this project can be found here. 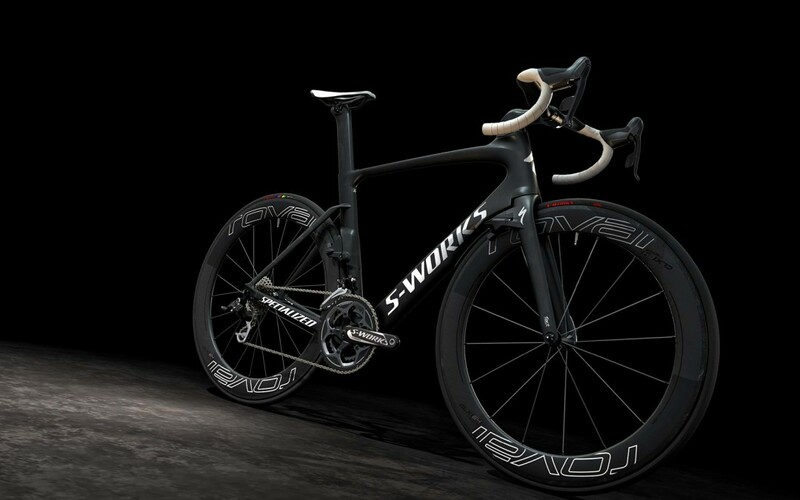 The Specialized S-Works Venge for 2016 is the fastest and most integrated road bike ever made. 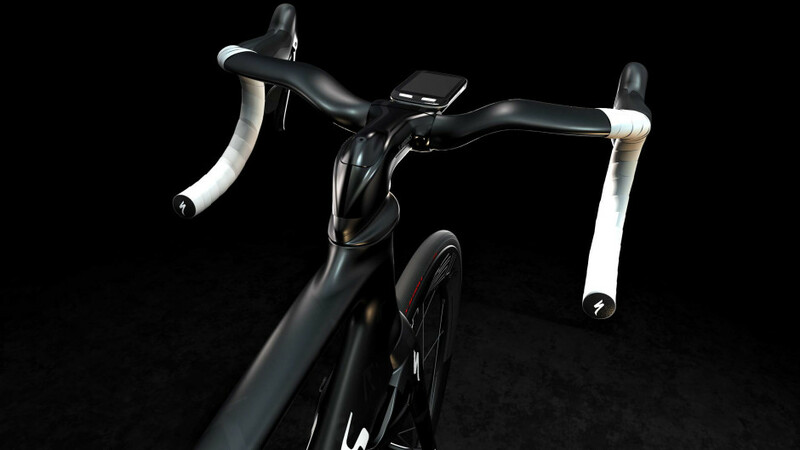 A team of 15 engineers used the Specialized Win Tunnel™, located at their headquarters in Morgan Hill, California, to develop this state-of-the-art bike. More than 1,000 hours of wind tunnel testing went into the ﬁnal design. 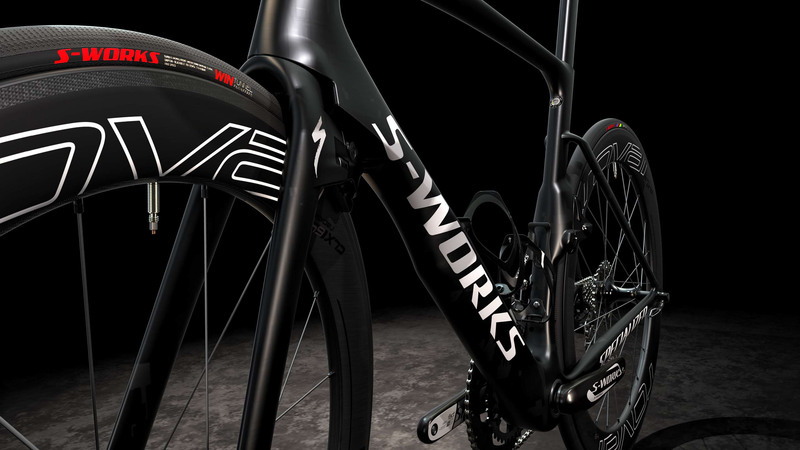 The S-Works Venge is one piece of an aerodynamic ecosystem that includes clothing, helmet, shoes, tires and wheels that together combine to save a competitive rider ﬁve minutes over 40 kilometers.